Can't find a home to buy in this crazy market? Go new construction! SOLD!!! Conveniently situated in Harvest Estates (Ramsey's newest development) this one is for you! 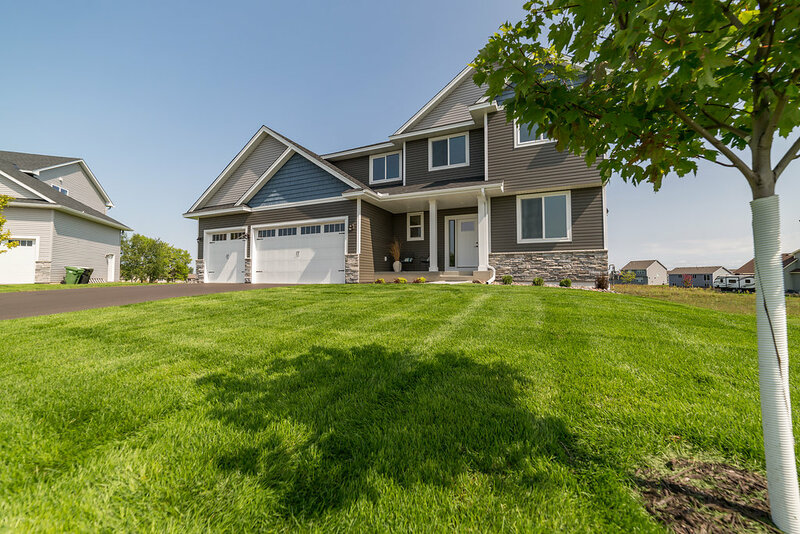 Caliber Homes Inc is a Minnesota premier custom home builder with a meticulous attention to detail. Quality and craftsmanship with a competitive price is the cornerstone of their philosophy when it comes to new home construction. Caliber Homes is also the proud recipient of the coveted Reggie Award for design and excellence! Featuring a charming covered front porch creating a welcoming entrance for your guests that expands out to the spacious foyer for plenty of room. A home office /den is immediately to your right so you can work from home in your brand new house! Gaze out the bay window at the change of seasons that Minnesotans enjoy. To the left is a mud room just off the huge garage equipped with lockers for the ultimate in organization! A crackling fire ensconced in stone chases away the winter chill in the wide open family room. Custom built-ins flank the fireplace to display your most prized possessions or an old picture of good old uncle Al! With an open concept floor plan, the kitchen is designed with use of space in mind and is complete with a natural stone topped with center island. Along with the immense supply of counter space there is a corner pantry and brand new appliances. 9' ceilings throughout the main level give a spacious feeling and add to the home's appearance. In the massive private master suite a tray vault accentuates the ceiling and adds an interesting dimension. 4 total spacious bedrooms are all on this upper level for privacy. A laundry room on this floor makes clothes washing a breeze! All of this is ready now!! Give us a call 763-746-3997 or email us at chrisfritchteam@kw.com for more details!